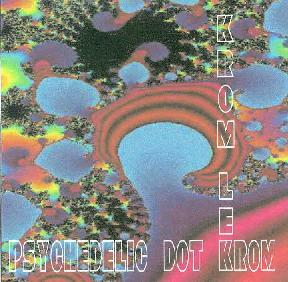 Krom Lek - "Psychedelic Dot Krom"
Last years debut by Krom Lek, "Inspirational Floatation Compilation", consisted of recordings from 1993-1995, and this new disc features all new tunes from this group of musicians from the NE of England. In my earlier review I described the band as playing trippy spacerock with hints of jazz, very much in the tradition of Gong and festie bands like Nukli and Omnia Opera; maybe even a bit of Ozric Tentacles in their lighter moments. While that description applies just as well to this new effort, I found the Gong and Ozrics influences to be stronger in spots, and the songs to be overall stronger and grabbed me even harder on my initial listens than their first release. "Long Meg" kicks off the set and is a great tune with trippy raga rhythms and Ozrics-like guitar leads. "Indian Rubber Man" includes Eastern rhythms embellished by tablas, flute and sax. It's that classic festie style of raga psychedelia. The rhythms and cool psych guitar give it a stronger Ozrics sound but this is a far more laid back affair than the fire of the Ozrics. Very head boppin' and you'll want to dance but only if you like to do so when stoned. "Gaia Mother" is a standout tune with trippy Indian percussion and horns, not unlike Spacious Mind. The bass and percussion are potent setting a firm base for the rest of the band and the chanting vocals. "Evolution" is a psychedelic Ska rhythmic tune tailor-made for flying into Jamaica on a paisley colored magic carpet. "Corruptaplod" is similar with sax-led Ska rhythms. Call it tripped out Reggae, or maybe even psychedelic Madness (remember them? ), but with totally cosmic space synths. And "Outer Aura", "Top O' The Tor", and "Summer Sun" are among my favorites. All are great catchy songs with a toe tappin' rhythm and some feel-good wailing wah guitar on "Outer Aura". In summary, Psychedelic Dot Krom is a must for fans of the festie bands and anyone into well crafted psychedelic music. This and the new disc by Dr Brown (also reviewed this issue) are the best festie styled discs I've heard this year.